Stay up to day, participate, get involved, share. Looking for a Travel Buddy? Prefer not to pay a Single Supplement? Want to share a ride to your destination? Here you can find other riders interested in the same. It is quick and simple ... and secure.. Become a fan of Equestrian horseback riding Vacations! Stay up to date for featured tour updates, and see Special offers. Share your pictures and stories with other travelers, or potential travelers, or find a friend to go with you on your next Hidden Trails adventure! 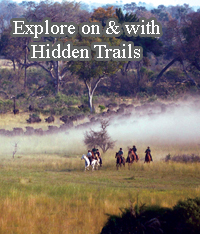 Receive updates from Hidden Trails any time there is a new Special Offer, a new trip has been added etc.